Choose from Milestone’s wide variety of aquatics classes, taught by certified instructors and available to members at no extra cost. We even offer specialty classes for selected health conditions. And swimming lessons are offered periodically throughout the year. Check out class descriptions below, then see our aquatics class schedule to find the day and time that works for you. Moderate class that focuses on cardio, strength, balance, coordination and mind/body awareness for a full body workout. Equipment is used for some exercises. Internal movements, using the properties of water for a full body workout. Movements incorporate 3 planes of motion to improve cardio, strength and endurance of the muscles. Performed in shoulder deep water; utilizes slow, deep breathing and wide range movements to give participants a true feel of control, balance, tranquility, and flow in the aquatic environment. Very relaxing! Join us for a non-stop, high energy aquatic workout! This class will focus on cardio and muscle endurance so you won't get cold in this powerhouse class as you challenge your fitness levels. Cardio and strength movement combinations patterned to maximize the resistance of the water. Stretch movements taken from ballet, yoga and Pilates to lengthen and strengthen muscles. The sequence of stretches will engage the core muscles for balance and flexibility improvements. Aqua Boot Camp class combines core strengthening, muscle toning, flexibility & cardio exercises. This class innovatively uses the unique buoyancy, resistance and movement of water. Ability to swim is recommended but can include non-swimmer and other aquatic exercisers. A powerful mix of cardio and strength in an interval environment. Intervals will alternate between cardio-based exercises and strength-based. The water, along with other equipment, will challenge all aspects of the body and increase your physical fitness level. Deep water class with flotation belt. (No impact.) Super workout for all levels. You don’t need to know how to swim. Join Jeff as he takes you on this high intensity workout that is the rage in the aquatic field. This workout is tailored for all fitness levels and is effective and fun! Designed to burn calories and make you sweat. Let’s get drenched! Class combines element of ballet, modern dance and Pilates to create a 45-minute workout that enhances core strength, balance and flexibility. Power packed high intensity shallow water workout. Fun! Faswt! Fabulous! All fitness levels are encouraged to try this class. Low-high intensity lower body workout. Space is limited so get your "ticket to ride" at the Service Desk before class starts. Please show up 10 minutes before class to get fitted on a bike. Must wear aqua shoes! Join us for a great ride! A variation of cardio and strength training exercises in the water. Great workout for all fitness levels. This High Intensity Interval Training class is a form of exercise that utilizes short bouts of very intense exercise intertwined with bouts of rest. HIIT transitions into the water with high powered results. A uniquely Chrystalline take on a gracefully fluid workout. Strategically designed so one move flows into the next until every muscle group has stretched and toned in a relaxed manner. This style of class is offered at several Florida resorts including The Biltmore Miami -Coral Gables. It develops trunk stabilization, helps correct posture and enhances muscle strength as all movements are initiated from the abdominals, lower back, hips and buttocks then flow outward to the extremities. Designed to help patients strengthen muscles and joints prior to hip and knee replacement surgery. Rotating instructors means you never know what type of higher intensity workout and music you'll get in this class. Be ready for fun intervals or circuits using a mix of equipment. Stretching, toning, mild cardio workout. 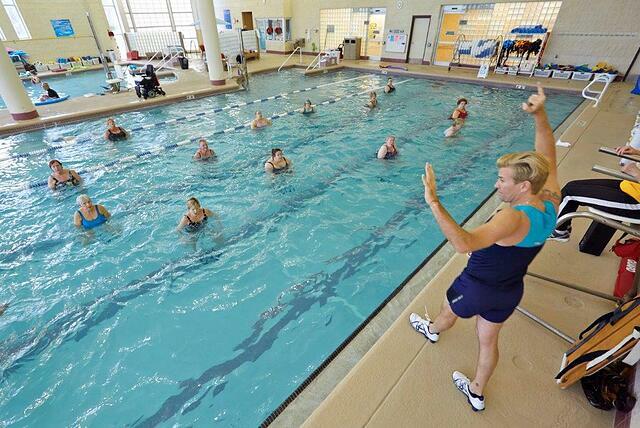 Aqua aerobics has proven benefits for those with a neurological condition. Because the water’s buoyancy supports 60 percent to 90 percent of body weight, exercising in the water is easier and increases range of motion and balance. In addition, the water temperature has a natural cooling effect, which makes for an overall pleasant mental and physical experience. Neuro Aqua class is geared for those with Multiple Sclerosis, Parkinson’s disease, Alzheimer’s, Dementia or other common neurological disorders. Includes stretching with full range of motion and toning. All fitness levels welcome. Building a stronger core by moving from the inside to outside. Slow stretches to mood music focusing on lifting through the crown of the head. Experience relaxing, strengthening, lengthening and calming effects. Some equipment will be used. This class emphasizes core strength through balance and stretching using all muscle groups. Great for overall rejuvenation. This class is a high intensity, low impact cardio class. Regular shallow H2O workout. Water Aerobics. Deep water class uses flotation belt for suspension in the water. Lots of cardio, strengthening and core work. You do not need to know how to swim to participate in this class. Group strength training in the water. Workouts target all major muscle groups using a variety of equipment. All fitness levels welcome. Come join us in the latest fitness trend adapted to the aquatic environment. This workout will leave you breathless…but wanting more! Watch the weight melt away! You will lose weight while gaining muscle. Great class for strengthening, toning, and stretching. Full range of motion. Very relaxing and helps to make you feel great. Follows the guidelines from the Arthritis Foundation. A series of Yoga postures and movements for strength, flexibility, balance and relaxation. Class will include use of equipment and end with mind/body meditation. Soft music will provide a calming atmosphere.